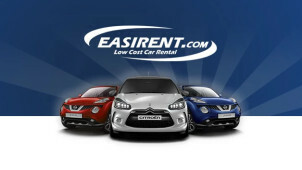 Easirent is considered to be the most cost-effective car hire service throughout the UK. Happy to meet you at the airport to drop off your car as well as make sure it is full of petrol for you, Easirent offer these small perks that larger car hire companies can’t. Pick from a huge range of coupés, MPVs and four wheel drives, divided into different categories like small, economy, compact, standard, executive Mercedes and BMW cars, large cars seating up to 7 and vans from standard transits, pick-up trucks, tippers to bigger Luton lorries - perfect if you are moving house. Easirent help you keep it simple and stress-free - all you need is your driver's license, bank card and passport to complete your booking when you pick up the car. You can even opt to take the vehicle abroad, as Easirent will be happy to upgrade your car as you wish when you pick it up. Don’t forget to check out the Easirent blog with plenty of handy tips in preparation for your trip. How do I use my Easirent promo code? Click on your promo code and go to the website. On the homepage enter your car hire details and preferences. Then enter your promo code under the dates and times. Press ‘Get a Quote’ before beginning the payment process. Join Easirents Loyalty card scheme for free and start earning points on what you spend, so you can receive discounts on your next booking. How do I cancel my Easirent booking? You can alter or cancel your booking through the ‘Manage my Booking’ online tool here. What if my plane is delayed or I am running late? Please call the branch or support line on 0203 657 6045 as soon as you can. There is a 30 minute grace period but after that late fees are incurred. What are the age limits for Easirent hires? You can hire and drive an Easirent vehicle if you are between the age of 23 and 75. How do I receive my Easirent booking confirmation? Easirent is a UK based hire car company offering a range of cars from your average 5-door hatchbacks to more luxury sedans, throughout England and Ireland’s major UK cities and airports. Use your Easirent promo code to make your car hire even more cost-effective and get that family holiday, business trip or day car hire sorted instantly with minimal hassle and maximum cost savings. Easirent now have a sister company site linked to its own company called ‘Easicampervanhire’, so if you are looking into doing a mega road trip and want to camp at various UK hotspots along the way, it offers motorhomes and campervans for hire throughout the British Isles. Find out more about the difference between hiring a motorhome and campervan by reading the blogs on the homepage. Easirent is all about ‘economy’. Check out its ‘Economy’ car category for the full range of its best top value cars for hire. With your Easirent discount code impress a client with the electric hybrid Toyota Yaris featuring all the mod-cons including a Toyota Touch 2 multimedia system or travel far and wide in a Vauxhall Corsa, roomy enough for the whole family with a rear bumper to attach a bicycle rack.